anzeige/ad: There is something high-end and super sophisticated about a good monochromatic outfit. Check out today’s blogpost to see the look I have created with my new Baum und Pferdgarten pieces. A super comfortable yet fashionable outfit I wore during Fashion Week in Berlin. Baum und Pferdgarten stands for strong colors, striking prints and contrasts. The Danish brand is based in Copenhagen and knows how to create fashion in a playful yet ageless way. Exclusive and high-quality materials, bold and extraordinary combinations. Baum und Pferdgarten is fashion-forward and always striking. Fashion Week in January is always a challenge. You don’t want to freeze. However, you don’t want to hide your outfit under a thick jacket. I decided to go for this padded warm SIMONE bomber jacket. I’m totally in love with the white details in combination with the pretty eden green. The details add a nice retro touch to the whole look. The crew neck and the striped cuffs and hem underline the sporty appearance. It has a slightly oversized fit, which allows you to wear a chunky and warm jumper underneath. I’m wearing the CLOVE knit jumper. It has a round neckline and extra long sleeves with contrasting stripes. At these temperatures knit pants are a lifesaver. I am wearing the Baum und Pferdgarten CORNELIA pants. I really love the relaxed fit and the contrasting stripes on each side of the leg. 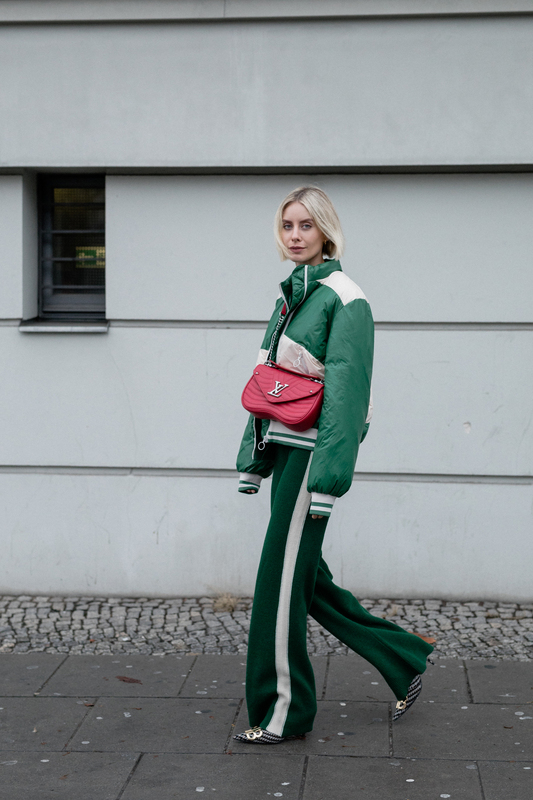 Track pants and bomber jackets will for sure never go out of style. They are super comfortable and extremely versatile. I went for heels instead of sneakers to add a feminine touch to the rather sporty outfit. Monochromatic outfits look extremely fashionable, when styled correctly. The key to wearing one single color well, is to match your pieces precisely. It’s all about finding shades of a single colour in various gradients. I like to play with silhouettes and layering in texture. My Baum und Pferdgarten jacket and pants are made of different textures and shades of one color. The green color looks slightly different, depending on its material. My outfit is very harmonious and put together, yet offers a variety of fabrics and silhouettes that make it look interesting and fashionable. I love setting highlights. The best colors to wear together as a statement, are shades that are complimentary of each other. 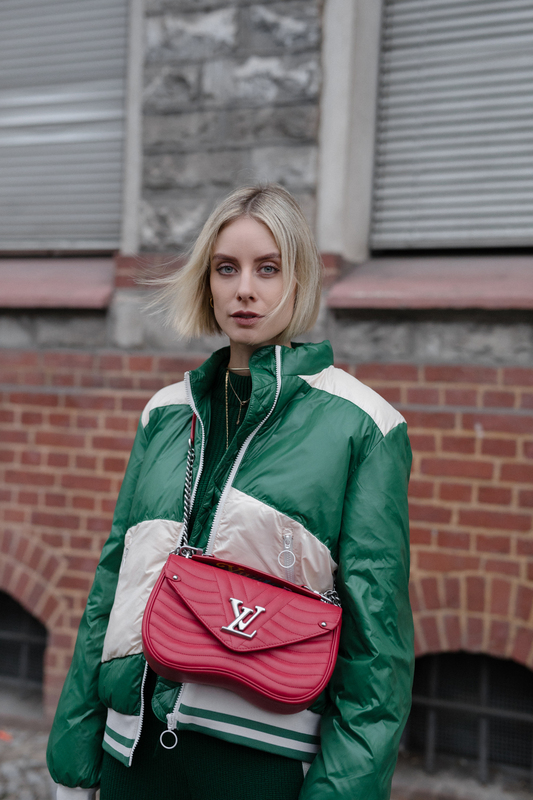 Red and green are not just perfect for your Christmas decoration, they are a great match when it comes to cool street style looks. Breaking up the monochromatic look with a tiny pop of red, instantly feels vibrant and fun. I love bold and unexpected combinations. 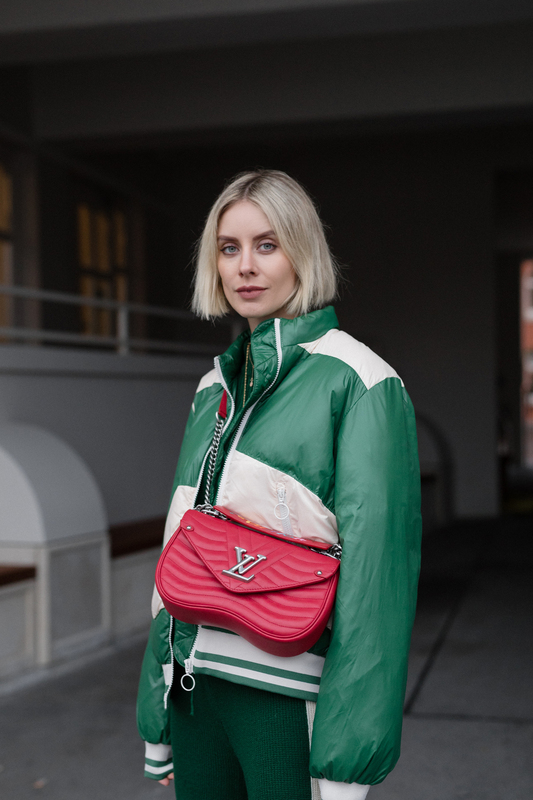 My Louis Vuitton New Wave bag underlines my casual retro look and is a perfect eye-catcher. Do you guys like the look?